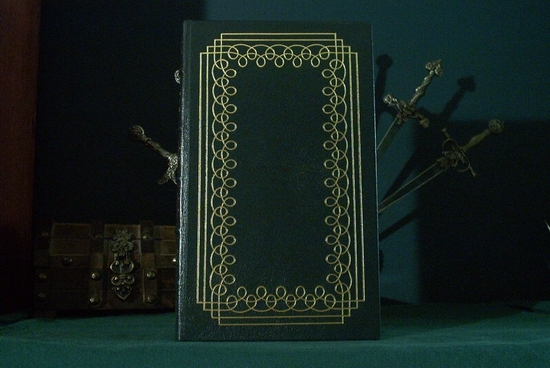 Leather bound book dealer and resource. 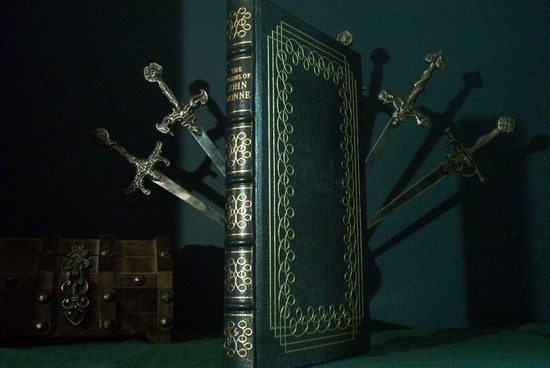 Specializing in publishers Easton Press, Franklin Library, Gryphon Editions and Palladium Press. John Donne (1573-1631), English poet, lawyer, and divine, born in London. At the age of eleven, he entered Hart Hall, Oxford University, where he studied for three years. According to some accounts, he spent the next three years at Cambridge University. He began the study of law at Lincoln's Inn, London, in 1592. About two years later, he relinquished the Roman Catholic faith, in which he had been brought up, and joined the Anglican Church. 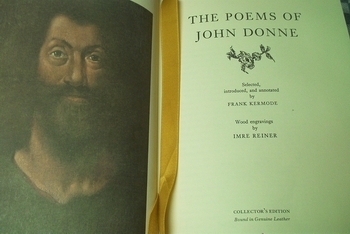 His first poems, Satires, written during this period of residence in London, are considered one of John Donne's most important literary efforts. 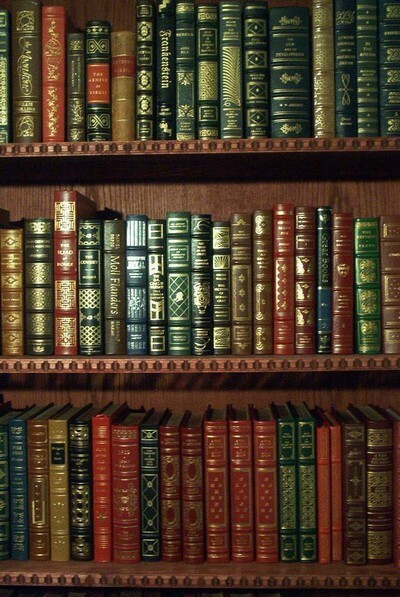 Although not immediately published, the volume had a fairly wide reader-ship through private circulation of the manuscript, as did his love poems, Songs and Sonnets, written at about the same time as the Satires. In 1596, possibly as a result of his friendship with Henry Wotton, whom he had met at Oxford, he joined the navel expedition which Robert Devereux, 2nd Earl of Essex, led against Cadiz, Spain. On his return to England, John Donne was appointed private secretary to Sir Thomas Egerton, Keeper of the Great Seal. His secret marriage, in 1601, to Egerton's niece, Anne More, resulted in his dismissal from this position and his confinement, for a brief period, in prison. A cousin of his wife offered the couple refuge in Pyrford. While there, John Donne wrote his longest poem, Metempsychosis; The Progress of the Soule, which ironically depicts the transmigration of the soul of Eve's apple. During the next few years, John Donne made a meager living as a lawyer, serving chiefly as legal counsel for Thomas Morton, an anti-Catholic pamphleteer. Donne may have collaborated with Morton in writing pamphlets which appeared under the later name from 1604 to 1607. Donne's principal literary accomplishments during this period were Devine Poems (1607) and the prose work Biathanatos (1644). In the later he argues that suicide is not intrinsically sinful. In 1608 reconciliation was affected between John Donne and his father-in-law, and his wife received a much needed dowry. His next work, Pseudo-martyr (1610), is a prose treatise maintaining that English Catholics could, without breach of their religious loyalty, pledge an oath of allegiance to King James 1. This work won him the friendship of the king, at whose urging John Donne became a priest of the Anglican Church in 1615. He was appointed royal chaplain later that year. In 1616 he received livings at Keystone, Huntingtonshire, became rector of Seven oaks, Kent, and was appointed divinity reader at Lincoln's Inn. He soon attained eminence as a preacher, delivering sermons that are regarded as the most brilliant and eloquent of his time. Meanwhile, he continued to write poems, among them Holy Sonnets (1618). In 1621 James 1 appointed him dean of St. Paul's Cathedral, a post he held until his death. Donne's friendship with Izaak Walton, who later wrote his biography, began in 1624. While convalescing from a severe illness Donne wrote Devotions Upon Emergent Occasions (1623-24), a prose work in which he outlined twenty-three phases of his illness and treated the themes of death and man's relationship to man. It is almost certain that John Donne would have become a Bishop in 1630 but for his ill health. During his final years he delivered a number of his most notable sermons, including the so-called funeral sermon, Deaths Duel (1631), delivered less than two months before his death. John Donne's poetry is characterized by complex imagery and irregularity of form. His intellectuality, introspection, colloquial usages, and striking syntheses of apparently irrelevant ideas made his poetry boldly divergent from his smooth, elegant verse of his day. His language was seemingly "unpoetic", but was always chosen for its unique precision of meaning and connotation. The content of his love poetry, often cynical and sensuous, and representing a reaction against the sentimental Elizabethan sonnet, influenced the attitudes of the Cavalier school of English poets. The 17th century religious poets, sometimes referred to as "the metaphysical poets", and including Richard Crashaw, Henry Vaughan, and George Herbert, drew their inspiration from the imagery and spirituality of Donne's religious poetry. John Donne was almost forgotten during the 18th century. There was renewed interest in his work during the 19th century, and its popularity reached new heights during the 20th century. Such modern poets as T.S. Eliot and W.H. Auden have been greatly influenced by his style. Most of John Donne's poetry remained unpublished until after his death. 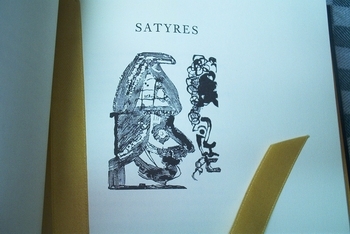 The first volume of his collected poetry was published in 1633.